Pinecone is Looking for Members ages 18-24 – If you fit this age requirement, and are looking to make some extra money, Pinecone is a great survey company to do that with. They are one of my favorites! 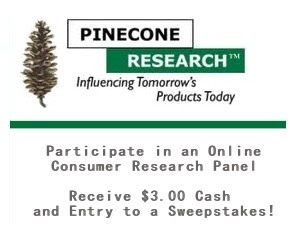 You can register with Pinecone to evaluate new product ideas and earn cash rewards for your opinions. If this will be your first survey company, I recommend setting up a new FREE email (like yahoo, gmail or something similar) to use when you sign up. That way all of your survey requests are easy to find in one spot and they don’t get mixed in with your regular email. So be sure to get signed up with Pinecone today and give it a try.